The annual cycle of buying stuff and throwing it away has begun. Freelance writer Peter Lollo was the coordinator of the Bear-ly Used Drive. As summer draws to a close, returning Cal students are swarming Berkeley. 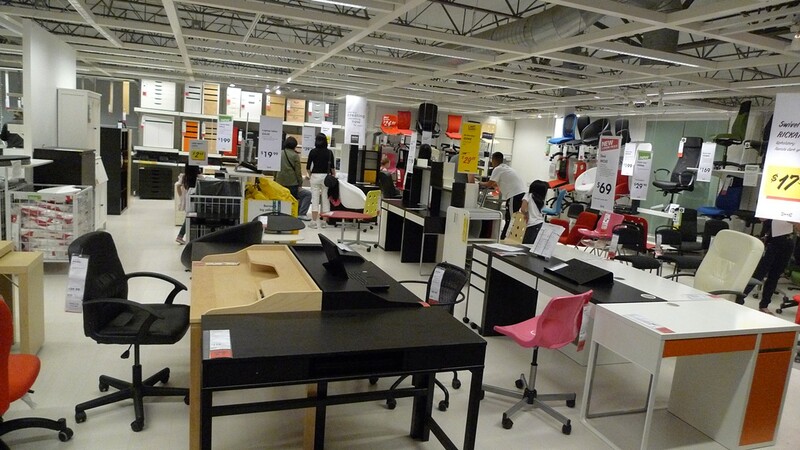 But the migratory spectacle is nowhere more evident than at IKEA and Target, as students rush to purchase furniture for their new residences. The annual buying frenzy stands in stark contrast to the scene just three months ago, when sidewalks and Dumpsters throughout the city were filled with furniture abandoned by students as the spring semester concluded. "It happens every May as the school year ends," noted Berkeley resident Mark Turpin. The cycle of UC Berkeley students buying and later discarding couches, TVs, and refrigerators is not just an annual oddity; it's one that incurs substantial environmental costs. Each spring, most of the items discarded by students end up in the landfill or are recycled as scrap metal or wood, instead of being reused by incoming students a few months later. UC Berkeley sophomore Ally Zimbalist recognizes the harm and illogic inherent in the wasteful cycle, but says that students are faced with few alternatives to dumping their belongings each spring. "Many students have only a few days, sometimes as little as 24 hours, between final exams and the time their leases expire," she pointed out. Over the years, the city and the university have collaborated in an effort to keep the discarded furniture from blighting city sidewalks, said Jim Hynes, assistant to the city manager. Under the Cal Move Out Program, bright yellow Dumpsters are deployed each May in neighborhoods with dense student populations. And the Dumpsters do not go unused. All twelve of the fourteen-cubic-yard containers are filled, dumped, and redeployed an average of once per day over the course of one month. Hynes noted that the program has not only resulted in cleaner streets but has also been the object of much praise from residents. Yet others lament that the large containers have the side effect of promoting more student waste, with the Dumpsters acting as "encouragement for students to throw away their unneeded belongings," Zimbalist noted. Last year, the Dumpsters collected 232 tons of materials in addition to the 1,799 items that solid-waste trucks gathered from the sidewalks. The cache included refrigerators, televisions, computers, small appliances, furniture, and mattresses, most of which were completely functional. About 11 percent of the items end up in the landfill, while the remaining 89 percent of reusable furnishings are crushed or torn apart and recycled for their wood or metal parts. The annual cycle is not just wasteful, it's expensive. The 2011 program is costing the city and university just over $202,000. It's a problem that is typical of college towns throughout the country. Yet many Cal students and Berkeley residents find it surprising that such a progressive, eco-conscious city cannot find a better way of addressing the issue. "I am severely disappointed in the kind of wasteful culture we have permitted to flourish around the campus," said former student Matt Senate, who last year led groups on daily outings to scour the Dumpsters for salvageable items. Even Hynes said he would like to move toward a zero-waste move-out in Berkeley, but calls the Dumpsters a "necessary stopgap until property managers and students take on more responsibility." Recently, some local organizations have been stepping up to address the problem. ReUSE, a student program on campus, implemented collection drives to gather clothing and textbooks from dormitories. To handle larger items, ReUSE created the website Exchange.Berkeley.edu, essentially a miniature version of Craigslist for the campus community. Last May, the Berkeley Student Cooperative created and operated another program to address the waste, with aid from the city, the university, and other groups. Known as the Bear-ly Used Drive, it allowed students to schedule free pickups for their furniture and other large goods. The items were then stored and eventually resold at steep discounts at a summer event known as the Bear-ly Used Bazaar. The pilot program was able to divert 114 cubic yards of waste, an amount equivalent to about eight loads from one of the city Dumpsters. According to the Bear-ly Used Drive's final report, a strict cost-benefit analysis of the program's diversion rate found it to be cheaper than the Dumpsters per unit of materials. However, the sheer quantity of waste in Berkeley is too much for the few organizations that are trying to deal with it. ReUSE Manager Sarah Cowan said that despite the success of the programs, "they are nevertheless currently unable to accommodate the enormous supply that is generated during move-out." Coordinators from the Berkeley Student Cooperative similarly acknowledged that their program must be scaled-up if it is to succeed the Dumpsters as the primary system of waste management. Zimbalist and others hope that entrepreneurs and nonprofits will view the cycle of waste as an opportunity. If storage were attained cheaply, an organization could capitalize on the huge supply of free furniture in May and the correspondingly large demand for furniture in August, all the while providing a needed environmental service. Berkeley, Zimbalist said, could "set an example for hundreds of other college towns." However, until that happens, the cycle of waste will likely continue unless students assume a more eco-conscious attitude. Zimbalist said, however, that she would not get "too optimistic" about the prospects of dramatic behavioral shifts. She could be right, considering that all the options the general student community has for disposing of goods require money and effort, while throwing furniture in a Dumpster is easy and costs nothing. So, for now, it seems likely that the arrival of May will be marked by the conversion of Berkeley sidewalks and Dumpsters into public IKEA showrooms, filled with functional items going to waste. And the city's year-round residents will again scratch their heads and recall that just nine months ago, students were furiously buying up the very same furniture.